Description: This woody plant is a shrub or small tree up to 20' tall with ascending to spreading branches. A large specimen has a trunk with grey bark. This bark is covered with rough flattened scales that are taller than wide. 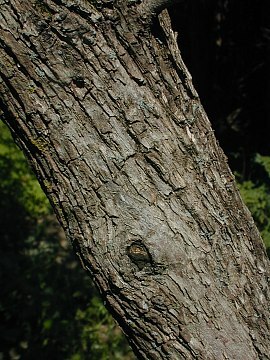 The thin grey bark of branches is often covered with scattered small bumps. Young branchlets and twigs are reddish brown and pubescent. The opposite leaves are up to 5" long and 2" across; they are ovate and smooth along their margins. The upper surface of each leaf is green, rough-textured, and sparingly covered with fine appressed hairs; there are 3-5 pairs of lateral veins that curve toward the outer margins of the leaf. The lower surface of each leaf is whitish green and densely short-pubescent (see photo). At the base of each leaf, there is a slender petiole up to 1" long. Cymes of white flowers develop from the axils of the leaves. Each cyme is about 2-4" across and either gently rounded or flattened at the top. Each white flower is about ¼" across; it has 4 lanceolate petals, 4 stamens, and a pistil with a single style. The blooming period occurs during the late spring or early summer for about 2-3 weeks. The flowers are replaced by white fleshy drupes, which ripen during the late summer or early fall. At this time, the peduncle and pedicels of the corymb become bright scarlet. Each drupe is about ¼" across and globoid in shape; it contains a single stone. The root system normally consists of a woody branching taproot. 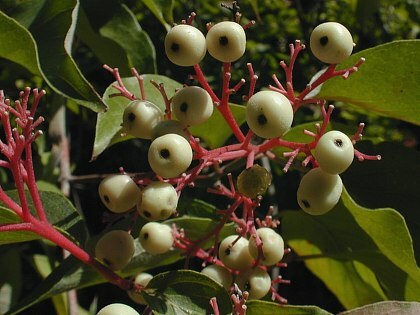 However, if this woody plant is subjected to disturbance, it may develop suckers or underground runners that send up vegetative shoots. These vegetative shoots can develop into a colony of multistemmed shrubs. Cultivation: This adaptable woody plant is typically found in partial sun and moist to slightly dry conditions. The soil can contain loam, clay-loam, or rocky material. Range & Habitat: The native Rough-Leaved Dogwood is occasional to locally common in most areas of Illinois, except the NE, where it is absent or uncommon (see Distribution Map). Habitats include upland rocky woodlands, openings in mesic woodlands, openings in floodplain woodlands, wooded areas along rivers or streams, savannas, woodland borders, and fence rows. This woody plant is one of the invaders of tallgrass prairies. Faunal Associations: The nectar and pollen of the flowers attract various bees, including honeybees, bumblebees, little carpenter bees (Ceratina spp. ), cuckoo bees (Nomada spp. ), Halictid bees, masked bees (Hylaeus spp. ), and Andrenid bees. Other insects visiting the flowers include predatory wasps, flies, butterflies, skippers, and beetles. Foliage and other parts of Cornus spp. (Dogwoods) are consumed by the caterpillars of several moth species (see Moth Table). Similarly, beetles, scales, mites, and other small invertebrates rely on Dogwoods as a source of food (see Insect Table). Because of their high caloric content, the drupes of Dogwoods are very attractive to the Wood Duck, upland gamebirds, and many songbirds; these birds can distribute the seeds across considerable distances (see the Bird Table for a listing of these species). Some mammals also eat the drupes, including the Black Bear, Fox Squirrel, Gray Squirrel, Eastern Chipmunk, and White-Footed Mouse. Finally, White-Tailed Deer and Elk browse on the foliage and twigs of Dogwoods. Photographic Location: A woodland opening at Busey Woods in Urbana, Illinois. Comments: Rough-Leaved Dogwood occurs primarily in the Midwest and the south-central states. It has rough pubescent leaves and bright white drupes; the latter disappear rapidly during the fall because of their attractiveness to wildlife. During the late spring or early summer, Rough-Leaved Dogwood produces cymes of flowers that are quite showy; they appear after the leaves have developed. An older scientific name for this species is Cornus asperifolia, which accounts for the common name. Other Cornus spp. (Dogwoods) can be distinguished from Rough-Leaved Dogwood by the shape of their leaves (more broad or more narrow), number of paired veins on each leaf, and/or color of their drupes (sometimes blue or red). 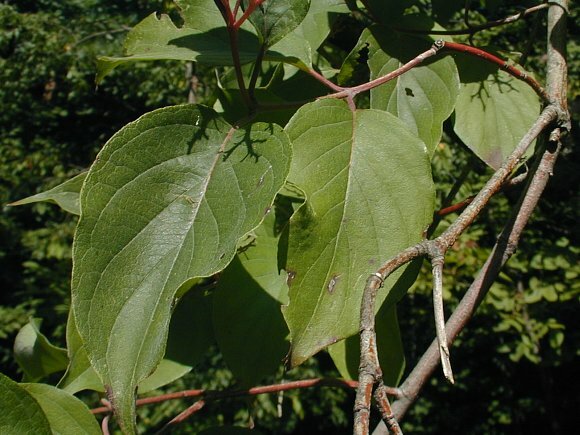 Their leaves and young branchlets are usually less pubescent than those of Rough-Leaved Dogwood.